It was good fun and I will be making more of this. I found myself a new hobby! This entry was posted in Bushcraft Clothing & Equipment, Customer Posts on September 19, 2011 by Woodlore Team. I couldn’t resist having another butchers (English for ‘look’) at your amazing design, having just submitted my own JP knife to the site. I was surprized at how much you must have influenced my approach. This is by far my favourite of all the worthy efforts on archive. Your mixture of media an subtle measured use use of it made me quite envious (in a good way;) Seeing it again, I think there should be a section just for the Julius knife with yours at the top of the rating. You have my thanks. Beautiful, Looks a very comfy handle Hans. 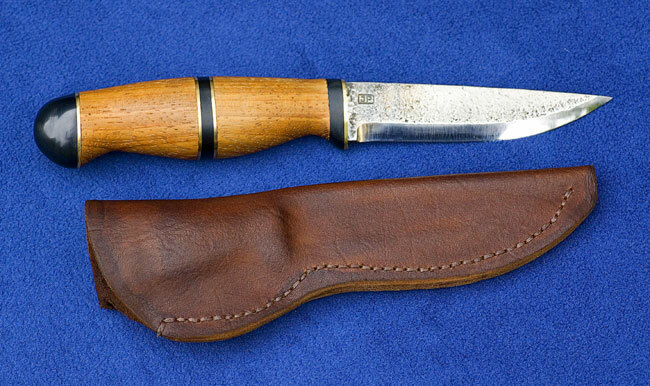 Good work Hans and good luck with the new hobby, it is rather addictive though 🙂 Julius was a big inspiration to me after seeing the Sweden episode of “Bushcraft” and Ive enjoyed making many blades and handles since.